Outbreakers’ Lab (OBL), run by HOTS - Hungarian Oncoming Tunes, is a mentoring camp for emerging artists from all over Europe, dedicated to those who seek knowledge and inspiration on how to upgrade their career or/and break out from the borders of their own domestic markets. From an experimental project dedicated to Hungarian artists and taking place in the village of Martely, OBL grew into an international event with the ambition to become one of the most important regional events for developing an artist’s potential. Join us, especially that the edition 2019 will take place in impressive Szigliget castle. Outbreakers’ Lab will take place between 25 - 28th of August 2019 in Szigliget, Hungary. For three days artists will work on their individual goals with international mentors on "one to one" sessions, workshops, outdoor panels and non-official gatherings. OBL is a live experience designed to transfer professional knowledge and innovative tools, inspire and exchange ideas. The inner dynamic of the Lab is driven by a great knowledge of mentors - the team of excellent experts representing different angles of the music industry. The OBL mentoring team 2019 will be represented, amongst others, by Magda Chołyst (Artist in Bloom, PL), Andries van Wieren (3S Music Management, NL), Andraz Kajzer (Festival MENT Ljubljana, SE). Artists will have a unique opportunity to develop their skills in planning a long-term career, goal-setting, understanding festival and tour strategies, a&r processes, budget and income planning. The Lab covers also basic terms of the industry and most crucial mental health practices. The OBL purpose is also to give participants a space to create a common fellowship, become more inspirational colleagues, not competitors on the market of emerging European acts. 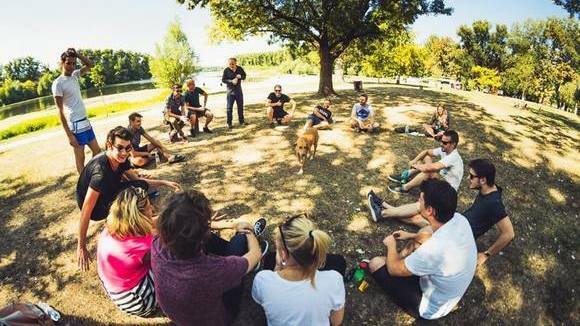 First Outbreakers’ Lab came to life in 2017 and took place in the small village, Martely, 200 km from Budapest. First edition was dedicated only to Hungarian acts looking for knowledge about how the music industry works and professional strategies for career development. OBL 2017 edition occurred to be a great success and had a significant impact on career up-grade of many acts. Going after the success, OBL 2018 opened its borders for international cooperation, hosting 49 guests from all over Europe. transfer from Budapest to Szigliget, accomodation, catering and all the educational programme. The cost that has to be covered by the artist is transport to Budapest. 4. You/your band has played at least 30 shows locally and/or internationally in the last two years. The final acts which fulfil the criteria will be chosen by the team of mentors till the 1st of May 2019. The chosen artists will be informed on the 15th of May 2019. The confirmation deadline for the artists is the 22nd of May 2019. The final list of participants will be announced on the 30th of May 2019 on HOTs social media channels and website. Because of the limited amount of participants, bands will be asked to choose maximum two (2) members of the band to attend the LAB.